Barry's practice is focused on the defense of personal injury, construction, nursing home claims, and professional liability litigation. His personal injury experience includes defending product liability claims, workplace injury and exposure claims, and transportation injury claims. In the area of construction law, Barry has defended a wide range of claims from construction site injuries to defective construction claims – ranging from single story to high-rise residential and commercial structures, including related claims for erosion, siltation and other environmental impacts. Many of these claims exposed the developers, contractors and trades to potential seven- and eight-figure judgments. In the area of professional liability, Barry has represented medical and legal providers, insurance agents, and brokers. Barry was one of the original three lawyers in the firm's Edwardsville office, having begun with Heyl Royster's Urbana office in 1985, and he returned to Heyl Royster in 2012, on the twenty-fifth anniversary of the opening of the Edwardsville office. He became a partner in 2016. From 1989 to 2012, Barry practiced in Atlanta, GA, first as an associate and then a partner with Hawkins & Parnell, and then with his own firm until 2012. He has taken numerous cases to verdict in both state and federal courts and has handled appellate matters in state and federal appellate courts, including the United States Supreme Court. He is licensed to practice in Illinois and Georgia, including the federal district and appellate courts in those states, and has arbitrated construction cases with the American Arbitration Association. He is also a trained mediator. 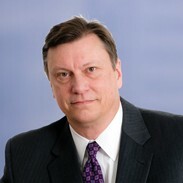 Barry has been ranked an AV Preeminent lawyer by Martindale-Hubbell since 1995. He is a member of The National Trial Lawyers Association - Top 100 Trial Lawyers, Georgia, a distinction that is reserved for the top 100 trial lawyers of a given state, and the firm's representative in the Leadership Council of Southwestern Illinois. Named to the Illinois Super Lawyers list (2018-2019). The Super Lawyers selection process is based on peer recognition and professional achievement. Only five percent of the lawyers in each state earn this designation.